A short while back, I posed a question to my twitter followers, when I was trying to think of something new to write for the blog. In an over-whelming show of support for this sort of crowd-thinking, a whopping ONE person chimed in, and suggested that I review Joe Hill's "Locke & Key." Naturally, my first thought was "Who the hell is Joe Hill, and why am I supposed to review his locksmithing service?" It turns out, that this is not some locksmith service, but rather a graphic novel from the mind of a man of rather distinguished birth. Sadly, my local book stores did not have a copy of the book... But I vowed that should I ever find the book, I would make a review. And now, I sit here book at my side, prepared to live up to my promise. For me, a graphic novel, is a very tricky animal. If it were a regular novel, the old saying "Don't Judge a book by its cover" would hold true, and at that point this would be a meaningless digression. However, in the realm of graphic novels, the cover is more than just a cover, it is the salesman. If a cover looks crappy, I pass it up. Bad art is an unforgivable sin for a graphic novel. 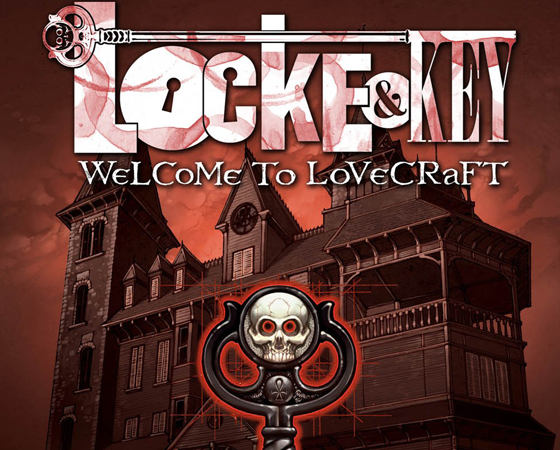 Fortunately, the cover for Locke and Key: Welcome to Lovecraft is not bad at all. It offers a simple design that manages to be both mildly creepy and somewhat inviting. A mix that earned it the price of admission. Flipping through the interior art, the art remains true to the promise of the cover. I think it can best be described as "fun". Gabriel Rodriguez and Jay Fotos deliver some exceptional pieces in this short book. The art makes me want to actually read the story, something that up to this point I have not started. I think it is important to get a feel for what the art is like before I dive in. If the art devolved, it would detract from the story Mr. Hill is trying to tell, and if I can not invest myself in the story, then the whole thing would be for naught. So far, it looks like Mr. Hill might get me to read his story. When I finally did get around to reading that story, what a story it was. It was a fun, violent romp, full of murder, insanity, magical doors, murder, and a kid who might be able to give Carl Grimes a run for his money for wondering off. Each character has a unique personality, and all of them have different ways of coping with the tragedy that acts as the impetus behind the whole story. At no point in the story did I see any character act in a way that was not consistent, and at all times it felt natural. This all leads me to believe that Joe Hill is in fact the great story-teller people have been informing me he was. I think however, the greatest praise that anyone can ever give the first graphic novel in a series is this, I really really want the next one. I finished book one, and nearly impulse bought the rest of the ones available on Amazon that instant, and stopped myself only when I realized I can't afford it at this time. Suffice to say, Joe Hill has cemented his spot on my list of authors to watch, and support. Read this book. Read it now. If you're a fan of horror, and like a graphic novel that does not feel like it is pandering to the lowest common denominator, this book is for you.